The CX-91 is an amazing aircraft for both newbie-intermediate and acrobatic flyers. 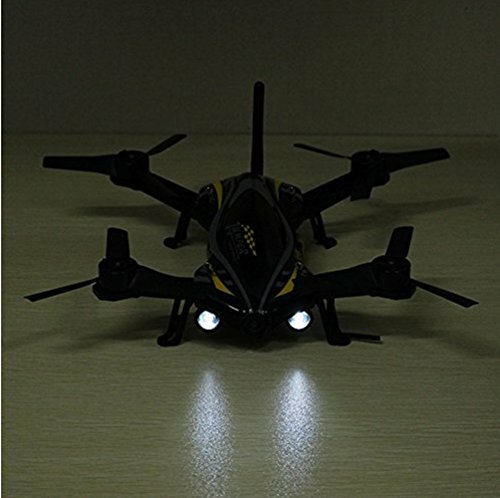 This drone is very affordable, durable and simple to use. Many manufacturers have realized that drone racing is the new trend among drone lovers and they decided to enter this new expanding market. Cheerson is one of the most well known manufacturers to do so. Cheerson are best known for their CX-10, CX-20 CX-35 and drones. However, with time, this brand is trying its hand at various new products and they tackle the FPV Drone Racing market pretty well. They have made a very affordable and unique drone – the Cheerson CX-91. The CX-91 is the Cheerson’s first ever brushless racer. Its tri blade propellers are the feature that makes this drone unique. This is also the main factor that makes the CX-91 the fastest drone on the market. The drone is loaded with flying and safety features and it is considered to be perfect for beginners as well as experienced pilots. The Cheerson CX-91 comes in a complete FPV package, ready to fly out of the box with no assembly needed. Consequently, this drone suits every pilot, from newbies to professionals. The drone looks like a flying race car. The CX-91’s body and rotor arms are made from one single piece of reinforced plastic. The CX-91 is above average in weight and size. The drone weighs about 420g (0.9 pounds) with battery and has a 240 x 250 x 80 mm size. As far as color goes, this drone is only available in black. The CX-91 is equipped with LED lights. Durability is another important feature of this drone. 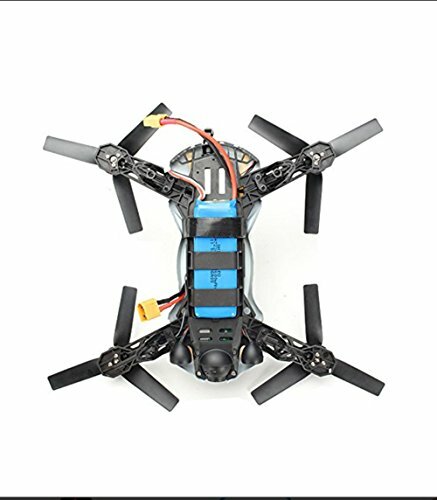 You are most likely going to crash at some point if you race FPV drones. For this reason it is nice to have a durable drone, and the CX-91 is unquestionably durable. And if you need to repair anything it is very simple to disassemble the drone. The CX-91 is also very manoeuvrable drone. It has maximum top speed of 80kmh (50 mph). This is more than enough for you to learn and practice how to fly a racing drone. The CX-91 uses an above-average sized battery to power its flight and comes with 1600 mAh battery. This battery allows about 12 minutes of flight time and needs about 90 minutes to fully charge. However, when estimating flight time it is very important to account for takeoff weight. The CX-91 has a safety system in case of battery running low. This system will make the drone to land safely and avoid severe crashes. The Cheerson CX-91 Jumper comes with a complete FPV package ready to fly out of the box. This means that it needs its own FPV camera. A 2 MP camera with fairly good image quality has the ability to record videos at 720p resolution, although at the lowest quality HD available. However, you will be happy with this quality of video if video quality is not one of your top priorities. Live video is transmitted directly to a 4.3 Inch FPV screen placed on the 2.4 GHz controller. This screen displays useful OSD data like current FPV channels and battery voltage. The CX-91 can be controlled up to 300 meters (984 feet) away from you using solely the 32 channel, 2.4 GHz controller for operation. This drone also has a 3D rollover with the basic sideward flight, down, up and backward flight. You can also have some fun with the hover mode. The CX-91 Jumper is a very acrobatic flyer. 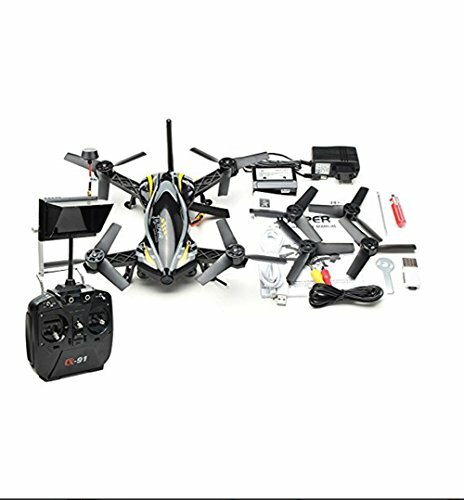 You will certainly love this drone to perform aerial tricks even though you are not into drone racing. This drone has two flights modes as the Manual and Stabilize. Manual Mode is suitable for experienced pilots because it puts the control entirely in the flyers hands. On Manual Mode you will be able to perform aerobatic barrel rolls, loops and Immelmann’s. You will need some training to perform these stunts, but you will surely amaze everyone at the racing track or at the park. On the other hand, the CX-91 can autonomously balance itself out on Stabilize Mode. This mode enables a much easier control of the drone and that’s why this mode is suitable for novices. The Cx-91 transmitter looks almost the same as the CX-20 Transmitter. The only difference is that it is black in color. The transmitter has a metal bracket which attaches to the back and holds the 4.3 inch FPV screen. The FPV video monitor is connected to the FPV glasses via a small cable which doubles as a USB charger. However, if you pull on the transmitter you also pull on the glasses. This system works, although it can be a bit distracting while flying. You will definitely enjoy this drone if you have a little flight experience and looking for a good RTF experience. The CX-91 is an amazing aircraft for both newbie-intermediate and acrobatic flyers. This drone is very affordable, durable and simple to use. It is extremely fast and has decent manoeuvrability. The CX-91 might not be for you if you like to upgrade, modify and tweak your drone. However, you should check it out if you want an affordable and complete FPV package with all you need to fly right out of the box.